Short Story. Not a children's story. 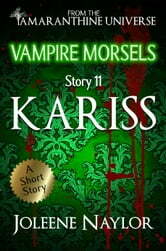 The eleventh in a collection about different vampires from the Amaranthine universe. Told in flashbacks between 1784 and 1820, Kariss must come to terms with her owm immortality and her mother's death. You can also find Kariss in the novel legacy of Ghosts.